Almost nothing feels easy about buying your first air fryer. This mainly results from the variety of features you face at the start of your quest for the ultimate cooker. Some buyers keep it simple; anything that fries chicken is good enough. Yet some of us seek a bit more in our fryers. Thus the big question emerges: is it worthwhile to pay extra for an expensive air fryer? On the surface, some of these extra features seem obvious. There’s no denying that some additional pounds usually nets a cooler visual design. However, beyond that, some of these extra features might not be so apparent. So then, where does all that money go for more expensive fryers? Let’s take a closer look to find the answer. 1 Should You Pay Extra For An Expensive Air Fryer? 1.1 Is It Worthwhile Paying Extra For a Digital Fryer? 2 Is More Wattage Better for Cooking in Air Fryers? Should You Pay Extra For An Expensive Air Fryer? This question probably sounds familiar. In all honesty, this is the question any conscious buyer asks when shopping for a new product. We all want to know if a higher price leads to higher quality. So to answer this question, let’s begin by diving into the features expensive air fryers offer. Is It Worthwhile Paying Extra For a Digital Fryer? Air fryers will either come with digital or analogue controls. As you likely guessed, digital options allow you to select exact times and temperatures for cooking your food. In other words, your settings will be as precise as possible. Cheaper air fryers often offer analogue dials for your cooking settings. So you spin a knob with numbers to select your time and temperature. It might not be the most fancy setting out there, but it still gets the job done. So then, why does this matter? Both of these settings styles will cook your food. So really, the big difference here is how they cook your food. Think of digital settings as more of a luxury option. Many offer a nice high-tech touch screen, which is perfect for showing off to your friends and guests. Yet, for practicality, digital does mean pre-set buttons. Therefore, you won’t need much guesswork when cooking popular dishes like chips and wings. Some air fryers up the ante by allowing you to programme times and temps for your favourite meals. Thus, you’ll find plenty of convenience with digital settings. In contrast, analogue dials rarely offer any of the above. In most cases, you get a dial or two, and that’s it. So with this category, your money buys you some extra convenience. If you prefer precision in your cook temperatures and one-touch stops, then digital settings are the way to go. Generally speaking, most expensive air fryers require no (or at most very little) preheat times. This means that you can put your food in the fryer, push start, and your food begins cooking instantly. On the other hand, cheaper air fryers often require longer preheat times. However, the preheating is still short when compared to the traditional oven. Oftentimes, you can begin cooking within two or three minutes. In theory, zero preheat times sound like a great option. Yet in practice, this convenience often creates more hype than anything helpful. For example, most of the foods you cook will require some preparation beforehand. So, while your coating your chicken or chopping potatoes, you can begin the preheating process. In fact, this feels habitual if you cook in an oven often. Also, if you know the preheat time on the air fryer, you can simply add those minutes to your cook times to received fully cooked meals. Since these times rarely exceed five minutes, the added time feels unnoticeable to most cooks. At the end of the day, this is still something for you to decide. If you often forget to preheat during meal prep, then this feature will be something to consider. However, if waiting an extra few minutes to eat your food is something you can tolerate, then any air fryer will satisfy you when it comes to preheating options, regardless of price. The amount of food an air fry holds ranks far from the most exciting feature. However, boring does not mean useless. In fact, capacity alone works as one of the most practical features a high price tag brings. Whether or not you need the capacity depends on how you plan to use your air fryer. If you plan on cooking single meals for your self, then smaller baskets will cook all the food you will need for one sitting. On the other hand, crowds require a larger capacity. 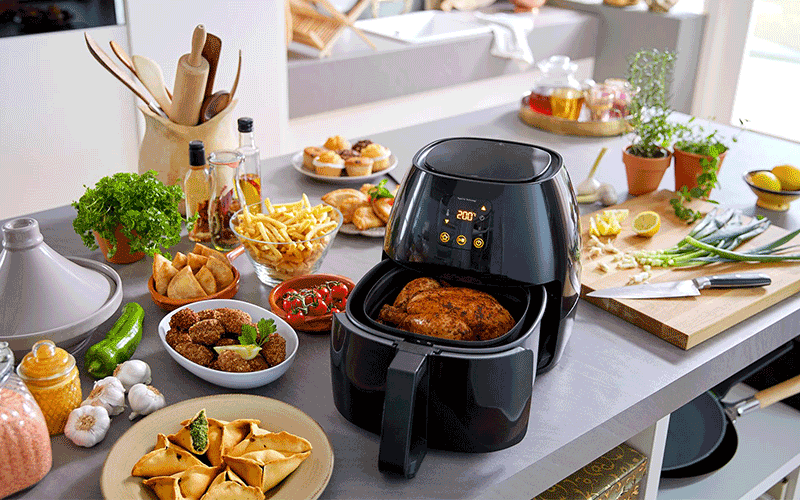 So if you plan to cook for family or friends during a gathering, you’ll want to invest in a larger air fryer. Generally speaking, 5 litres of capacity will allow you to cook for about 4 people. If you need more space, you can usually find air fryers with more than 7.5 litres of space. These rarely cost any more than £40 extra when compared to 5 litre fryers. Is More Wattage Better for Cooking in Air Fryers? As far as wattage goes, most air fryers carry somewhere between 1200 to 1500 watts. However, if you want some extra power, some air fryers will allow for upwards of 1800 watts. So, why would you want so much power? The main reason involves faster cook times. Usually, you can cut a minute or two off recipes with higher temperatures. If you stack this value with an air fryer that does not require a preheat time, you will certainly notice the difference in cooking times. So who wouldn’t want their food faster? However, note that you will not always need to cook your food at high temperatures. For example, some recipes such as roasted chicken will only need temperatures around 350. At these lower temperatures, the difference in cooking time amounts to nothing noteworthy. So at the end of the day, the question here really involves how much you value your time. If you want to possibly save a few minutes when frying your favourite foods, then an air fryer with some extra wattage will justify the higher cost. Bottom Line: Are Expensive Air Fryers Worth It? Air fryers can be expensive or cheap. The price you pay truly depends on the brand and features. So really, the big question involves whether or not paying extra for an air fryer is worth it. So consider your needs carefully. If you want some digital features and faster cook times, then paying an extra £100 pounds will not feel like a major hit to your wallet. However, if you feel content with more simplistic features, then do not be afraid to browse the budget air fryers. All in all, air fryers seem promising for the culinary future. And if you want to eat some tasty fried foods in a new and healthy manner, then this is definitely the product to consider. So take a look at the features that matter to you. This is truly the best means of deciding whether to by an expensive or budget friendly air fryer. Liked this? Check out our guide to the best air fryers.